It is already four years since the release of the album ‘Yallah’ by the Czech quintet BraAgas was released, with music from southern Europe: Serbia, Turkey and Sephardic music from ancient Spain. On their new album ‘O ptácích a rybách’ the group focuses on music Moravia with nice arrangements of ancient melodies. Local music is still very popular in the Czech Republic. Age-old music is edited, played on traditional instruments and sung in Czech. Groups like Hradistan (with Jiri Pavlica), Traband and Tomás Kocko became popular and you can easily add BraAgas to this collection. A contemporary women’s group, specialized in new Czech folk, although the group on their new album ‘O ptácích a rybách’ (‘About birds and fish’) ‘limits’ itself to Moravishe melodies. In 2007 the group was founded in Prague, released 5 albums and gave concerts all over Europe. BraAgas stands out for the beautiful vocals that alternate with solo and polyphonic pieces; powerful and well-groomed, nicely delineated by instrumental pieces played on a range of traditional instruments including cistra (kind of mandolin), hurdy-gurdy, guitar, flute, clarinet, bagpipes and percussion. The quintet is assisted by a few vocal guest musicians who play percussion, didgeridoo and bass guitar. Beautiful ballads are alternated with faster songs. Although Czech is unintelligible for the average Western European people and text translations are (unfortunately) not included, the music has a huge impact. The group convinces with beautiful songs played in a variety of arrangements. 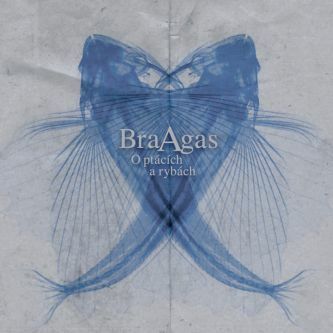 Again BraAgas succeeds to release a excellent world-album that can easily last for years!